This new book by Jim Mellon and Al Chalabi is a layman’s guide to longevity. It investigates the new technologies and explains how to benefit from the life extending technologies both personally and professionally. 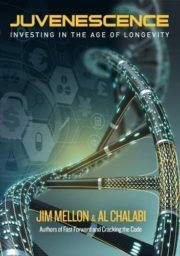 It helps readers unravel the science, offers ideas on potential investment and reveals the views of the key opinion leaders.